Does Australia have the world's silliest mining industry? Setting a new benchmark in silliness, the Australian mining industry made not one, not two, but three laughable media releases last month. 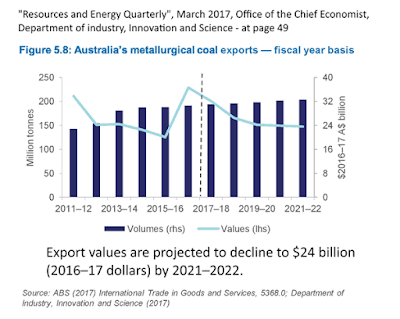 On 11 May 2017 Minerals Council of Australia made a bold "projection" on the future of coal mining in Australia. The "projection" made from data from the Resources and Energy March Quarterly of a government department report was that the coal industry had a great future - at least until 30 June 2017 - when the value of exports of thermal and metallurgical coal was expected to be almost $55 billion. Not many investment decisions are made on the basis of a "projection" of the final two months of the current fiscal year. 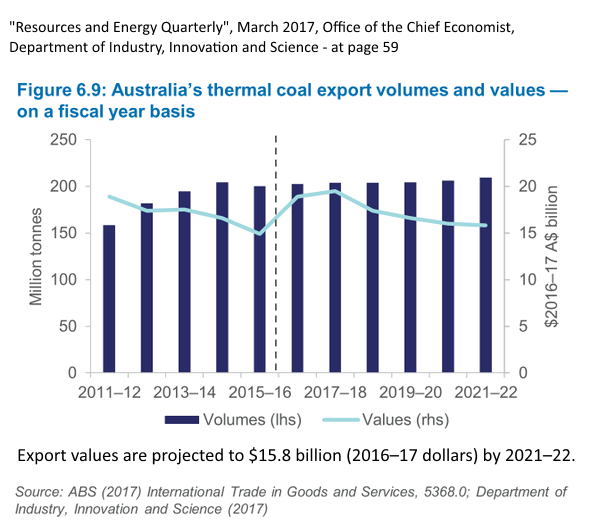 On this "projection" the Minerals Council of Australia made the silly declaration: "Myth 1 Australia's thermal coal exports are in decline...BUSTED "
The Resources and Energy March Quarterly the Minerals Council of Australia thought worthy of quoting contains real projections for the value of Australia's coal exports to 2021-22. Those projections show a dramatic decline from the peak of $55 billion in 2016-17 to just $39.8 billion in 2021-22. On 17 May 2017 Minerals Council of Australia issued another media release with the puzzling title "New Report: Low emission coal technology key to growth in South-East Asia". The levelized cost of electricity generation (LCOE)14 is commonly used in national power development plans to compare the costs of different technologies. Based on IEA assumptions for the costs of capital, operation and maintenance, and finance, and using 2015 prices for coal and gas ($63.5/t for coal and $10.3/MMBtu for gas), the generating cost of a new supercritical (SC) coal plant is 35 per cent cheaper than the generating cost for a new CCGT plant (Figure 6). However, at August 2016 coal and gas prices, the generating costs for coal and gas are similar – even slightly cheaper for gas. 14The LCOE includes fixed costs, variable costs (operation and maintenance and fuel) and financing costs for new power plants. In order to make meaningful comparisons, it is necessary to make a range of assumptions about various costs and operating parameters of competing technologies, as well as assumptions on future coal and gas prices. coal and gas prices, the generating costs for coal and gas are similar – even slightly cheaper for gas. Keeping the silliest announcement till last on 29 May 2017 Minerals Council of Australia issued another media release with the cryptic title "Government takes balanced view on low emission strategy". The Australian coal industry supports the government’s sensible policy which recognises the role of our high quality coal in helping to curb emissions. If the policy intent is all about reducing emissions we should have a technology neutral approach and that means considering the opportunity coal offers when utilising both high efficiency low emission (HELE) and carbon capture and storage (CCS). Including CCS in the Clean Energy Finance Corporation (CEFC) ambit strengthens our capacity to lower emissions in the supply of electricity. It is what the media release doesn't say that is incredibly silly: if a power station operator can release CO2 into the atmosphere for free, then it is absurd to imagine any investment in capturing and storing that CO2. The government which is led around by the Minerals Council of Australia has ruled out imposing any scheme to put a price on the release of CO2 into the atmosphere.